Richard Bland was a childhood mentor to Thomas Jefferson and, indirectly, most of the Revolutionary Generation. He was arguing against unfair British taxes long before most of the Founding Fathers came of age. Richard Bland was one of the first to speak out for the rights of colonial Americans against British encroachment. In 1752, a full twenty years before the outbreak of the American Revolution, Bland argued for the colonists in the Pistole Fee Controversy. The Governor of Virginia began demanding that all land patents receive a stamp of approval which cost one pistole. Fairly common at the time, a pistole was a form of currency roughly equal to one Spanish gold coin. While Bland did not seem to have a problem with the fee itself, he was upset that the law was passed by the Royal Governor and not the Virginia House of Burgesses. In response, Richard wrote his first popular pamphlet, A Fragment on the Pistole Fee, which established him as a leading proponent of colonial rights. A Fragment argued that, although Parliament could make laws affecting the empire, they could not regulate the internal affairs of the colonies. It is also worth noting the similarities between the Pistole Fee and the Stamp Act which would arrive thirteen years later. By 1758, Bland was asked to write the Two Penny Acts. These Acts changed the pay of ministers from tobacco to paper money for one year because of a poor harvest. In what became known as the Parson's Cause, Parliament vetoed this temporary law. In the ensuing court case, a young Patrick Henry first gained fame defending Bland’s Acts. 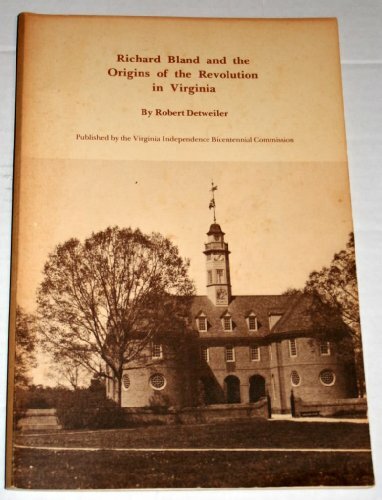 Again, Bland wrote a pamphlet, A Letter to the Clergy of Virginia, insisting that the government had overstepped it’s bounds in regulating the local laws of the colony. Although Virginia was prohibited by the Governor to attend, Richard Bland was a supporter of the Stamp Act Congress. He soon wrote his most famous pamphlet, An Inquiry into the Rights of the British Colonies. 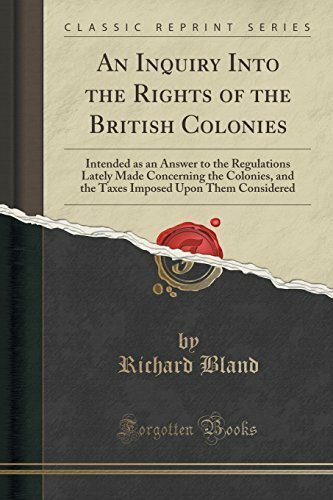 Here, Bland took his position even further, arguing that Parliament had no right to tax the colonies without their consent in any cases whatsoever. There are other Founders who receive credit for the slogan ‘no taxation without representation,’ but it is here that the ideas for that motto are laid out. Richard Bland would later go to the First and Second Continental Congresses. He was a signatory of the Articles of Association; however, ill health would prevent him from attending the debates on Independence. Richard Bland would live just long enough to see the United States become an independent nation. The next generation of political leaders were creating a country based off arguments he had detailed decades before. For a new Founder everyday, please subscribe to our email list.